UK Money Bloggers – Show Me The Money! What a weekend! I am just coming down to earth from a whirlwind cross country tour of two incredible blogging events. I have learnt SO much, got so many new contacts, come away with a ton of goodies and made some amazing new ‘blog friends’. And best of all, I have the longest to do list of how to really up my game when it comes to my blog. Whilst I am bursting with enthusiasm now after the events, I have to admit that I was more than a bit apprehensive beforehand about heading off to these conferences knowing no one at all! I say that… There is a UK Money Bloggers Facebook forum and we chat online every day. Many of these guys have helped me hugely; there is constant interaction and collaboration – amazing amounts of knowledge and opportunity sharing like I’ve never experienced before in the corporate world. It means I feel as if I know them even though we’d never actually met! Facebook can do that, can’t it?! Plus I was part of the beta test group for Emma’s course on monetizing your blog so have had a fair bit of interaction with her and others from this community online through the course. That said, it’s easy being chatty online but walking in to a room full of people you’ve never met before and many of whom are already well known to eachother – it’s fair to say I did feel slightly nervous! But on Saturday, it was finally time to meet them in real life. Armed with my business cards and a big smile, off I trotted down to London. The UK Money Bloggers Conference & Show Me The Money Awards are organized by Andy Webb from Be Clever With Your Cash. It provided a great opportunity to hear from experts in the financial world on current trends – we talked the advent of open banking in a session hosted by Yolt, whether people are saving enough in ISAs and pensions with Vanguard and keeping your data secure with Experian. We also heard from bloggers who are totally smashing it when it comes to working on collaborations with brands and those who are really embracing social media to their advantage and running profitable and engaged Facebook groups. The day was full on with back to back talks, networking with others bloggers and PRs and small group break out sessions. The session I did on Pinterest was so useful because this is the one social channel I’m still getting to grips with! Towards the end of the day, the Show Me The Money Awards was the opportunity for the best of the best to be rewarded for their achievements over the past year. Debt Camel was named Money Blogger of the Year 2017. Not only does she write an ace blog but Sara is one of the most generous of the group with her time and expertise – she always chimes in with support and advice. Thoroughly well deserved! The full list of winning blogs and bloggers is here. I’ve come away with some great ideas for future posts and am buzzing to get them all written up. 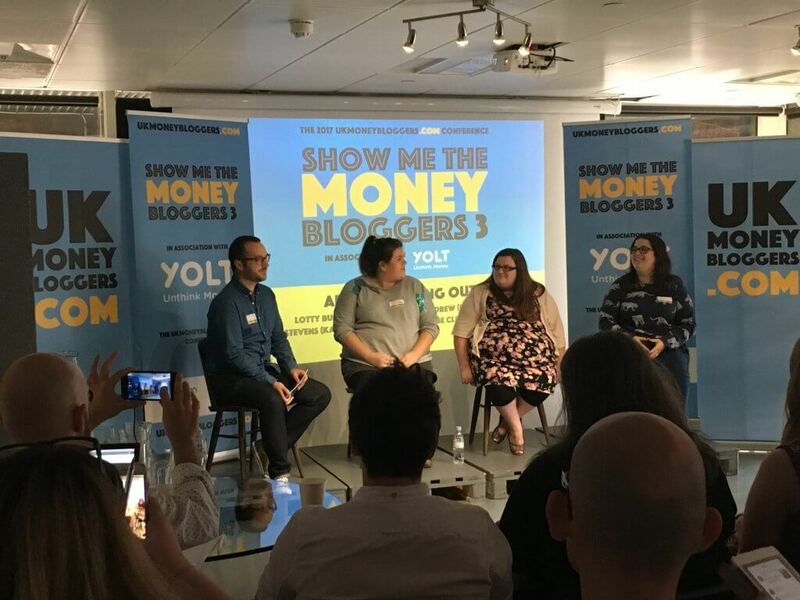 The UK Money Bloggers Christmas campaign was also finalized at the conference – more on that at the end of October but it’s safe to say it’s a great campaign and I’m really looking forward to making a positive impact through the power this group of people has! My throat was sore and my legs were tired when I made my way to the train home. But I had a big smile on my face and was excited to have some familiar faces to meet up with in Manchester the next day for the second blogging conference of the weekend….